Steve Smith left Sunday's action with one reception for 44 yards. The Panthers’ fourth-quarter comeback was nothing less than spectacular in Sunday’s win over the Saints. But the NFC South leader had to do it without one of its veteran wide receivers. 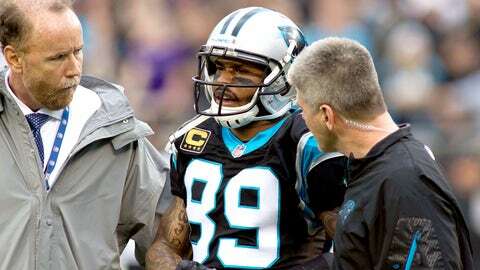 Steve Smith, who left the game in the first quarter with a left knee injury, will undergo an MRI Monday morning, a source close to Smith told FOXSports.com. Smith fell to the turf without being touched. Initially, the team listed him as questionable to return. Smith returned to action for one more play, but couldn’t go any longer and was ruled out for the remainder of the game. The source noted "it is not good, but it is not bad either." The 13-year veteran left the game with one reception for 44 yards.